Four years ago, I made the biggest investment of my life: I bought my first property. It took only about four or five viewings before I found my dream home: a centrally-located flat, on a high floor, with an unblocked view and a North-South orientation. It was a three-room HDB flat in Everton Park, which I purchased for $440,000. Originally built in 1965 to house workers of the Singapore Harbour Board (the precursor to today’s PSA), the estate’s seven 12-storey blocks were converted to public housing in 1980. The estate had a distinct retro charm, which I loved. Among other things, the parapets had ventilation blocks with geometric designs, while some staircases had arched openings. These were architectural features that do not exist in newer HDBs. The previous occupants did very little remodelling to the 72 sqm (775 sq. ft.) unit, so it was more or less in original condition. Perfect – I wanted to gut the interior anyway. A friend who worked at interior design magazine Lookbox Living recommended the firm Artistroom. The design studio is made up of the husband-and-wife team Mark Chen and Katy Chong, who understood exactly what I wanted during our initial meeting. 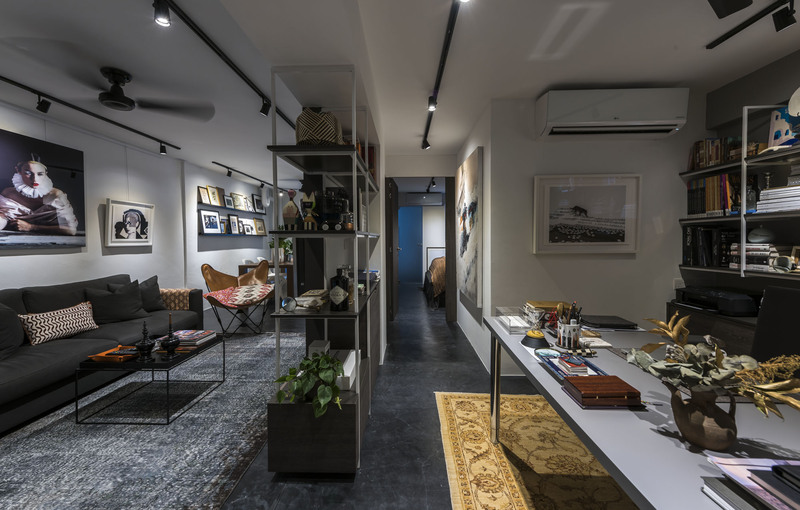 “You want a home that’s set up like an art gallery,” Chong remarked, taking the words right out of my mouth. I promptly decided to work with them. Like most three-room flats of the era, mine was constructed with a narrow frontage and deep interior. The layout, too, was very typical: a living-dining area, two bedrooms, a kitchen, bathroom, WC and utility room.